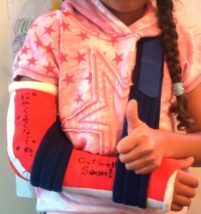 *My daughter has broken her arm and got a cast on her right arm. *She could choose her plaster cast. *She will be allowed to take the plaster off by the end of the month.